SMA Multicluster Box 12 for Sunny Island the right solution for your commercial PV. 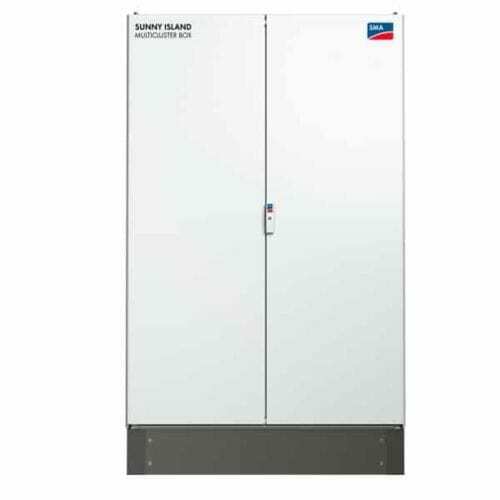 The power of the AC main distribution unit for Sunny Island systems has been increased by 20 %. 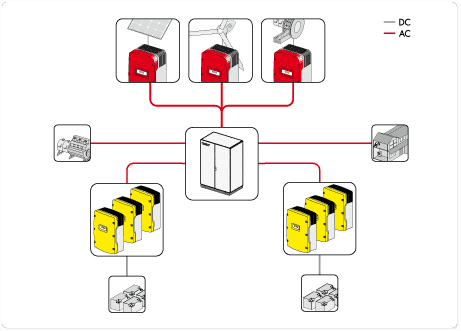 The box allows off-grid and hybrid systems to be implemented even more cost-effectively. All in the power ranges of 20 to 300 kW. 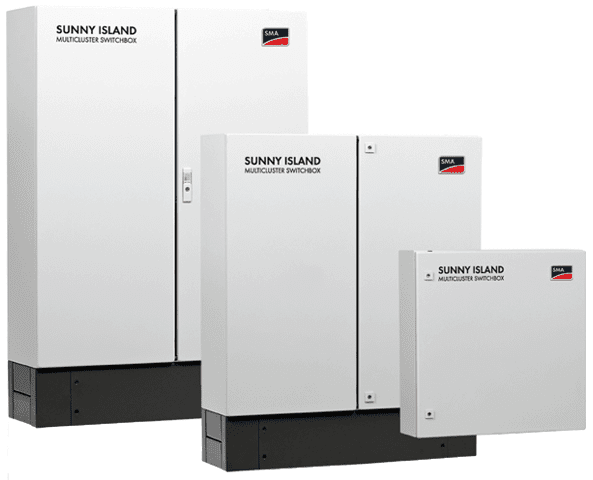 Based on proven technology, 2 to 12 three-phase clusters, each consisting of 3 Sunny Island inverters, can be connected in parallel. The SMA Multicluster Box 12 for Sunny Island is completely wired and fitted at the factory and have a main connector for generators, the load distribution and PV or wind turbine systems. All data cables required for the installation are included in the delivery. With the Multicluster solution for Sunny Island, you really have thought of everything. Even complex energy supply solutions are easy to implement. SMA from its headquarters in Kassel, Germany, is the world’s largest producer of solar inverters and monitoring systems for photovoltaic applications. As market leader for solar inverters SMA is setting benchmarks again and again. The leading-edge efficiencies of 98% and new technology ensures maximum yields and the highest user convenience. SMA inverters are designed in Germany. The Sunny Central, the Sunny Island, and SMA SunnyBoy inverters in the 3 kW to 7 kW range are assembled in their new plant in Denver, Colorado. The inverters qualify for the ARRA recovery act and are UL and cUL listed. SMA launched its own SMA solar academy in Rocklin, California, in April 2011. Their Solar Academy is equipped with the latest high-tech teaching tools and demonstration inverters to complement its range of courses on SMA products. Join our ZERO Home Bills Community. BEST Products from the BEST Brands at BEST Prices for ZERO Home Bills on ZEROhomebills.com by Solaranna. All inverters support a range of optional display and monitoring accessories for visualization of the system operation and many models have Bluetooth built-in as standard enabling fast integration with these additional products. Join our ZEROhomebills Community.